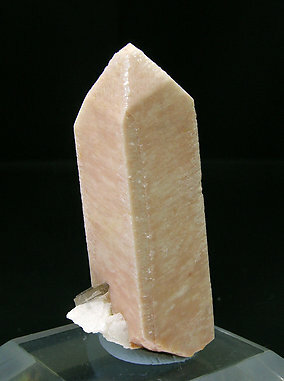 Aggregate of crystals with very well defined parallel growths, Manebach law twinned with a pale pink color. A really very interesting specimen. 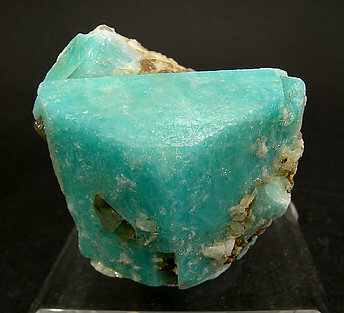 One can see how the Quartz and Microcline have grown together and then have continued until they end in the geometric faces of a crystal of amazonite, which is also large, well defined, and has good color. 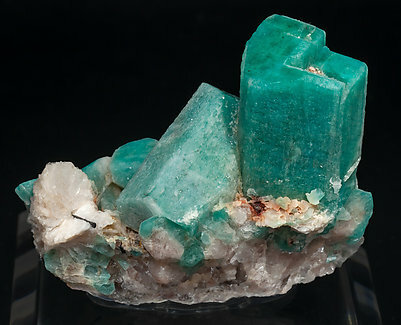 Parallel aggregate of crystals with very well defined faces and edges, some of them doubly terminated and with a neat color zoning, intense bluish green on the terminations and clearer on the dominant faces. In this single crystal the color is magnificent, and the faces are exceptionally well-developed. 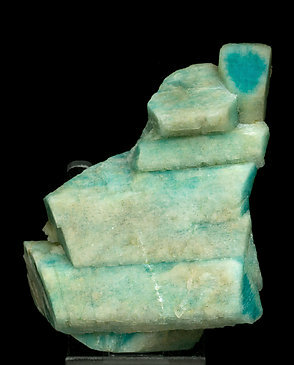 RL27K9: Microcline (variety amazonite) "whitecap"
Amazonite crystal with a second crystallization phase, known as “whitecap” (or white termination), the top side of the amazonite is this color. 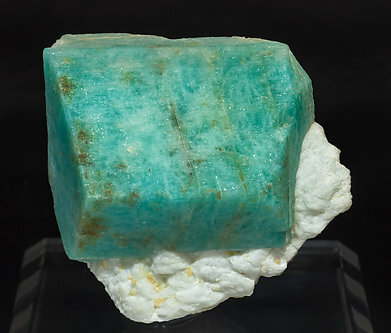 Single and partially doubly terminated Microcline (amazonite variety) crystal with very well defined faces and edges, a good green color, not as bluish as the classic Colorado amazonites, and on a matrix of Quartz and Albite. The sample is from the Carles Manresa collection whose label we’ll send to the buyer. 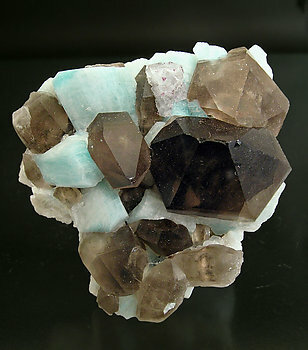 Group of Microcline (amazonite variety) crystals on matrix with a small Albite rosette and a small acicular Schorl crystal. The sample, a very old one, is not repaired. 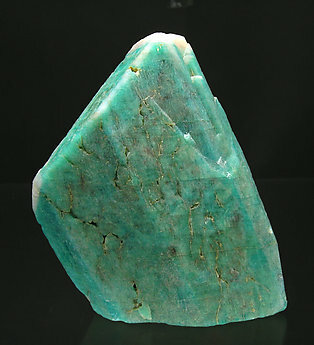 Microcline crystal (amazonite variety) showing well defined faces and edges, with intense bluish-green color and on smoky Quartz crystals, very rich in inclusions. An American classic. 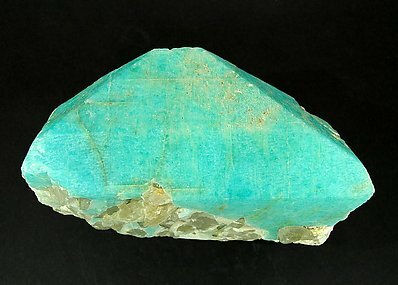 Large group of sharp microcline crystals with very well defined faces and edges and a very well defined Manebach twin. 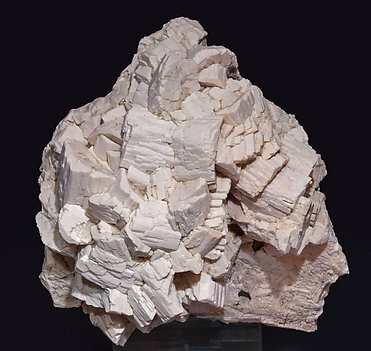 It is with Albite and is coated by pinkish micro-crystalline Quartz that gives to it an unusual aspect, so unusual as the locality where it comes from. 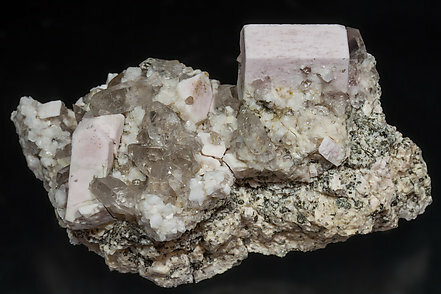 Microcline crystals with very well defined Baveno-law twins, with a pale pinkish color, with a parallel smoky Quartz crystal and groups of white Albite crystals. The sample is from the Daunis collection whose label we’ll send to the buyer. 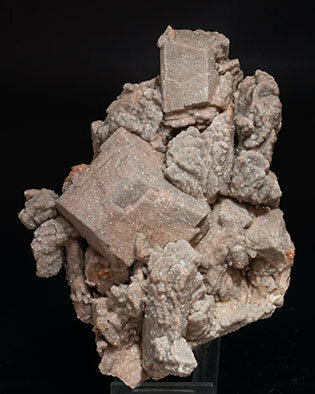 Group of Baveno law twinned Microcline crystals, mostly equant, but one of them clearly dominant and elongated, shows twinning by both the Baveno and Manebach laws. They are on matrix with Quartz crystals. The sample is from the first historic place of the earliest high quality amethyst finds at the Montseny massif decades before the modern finds. 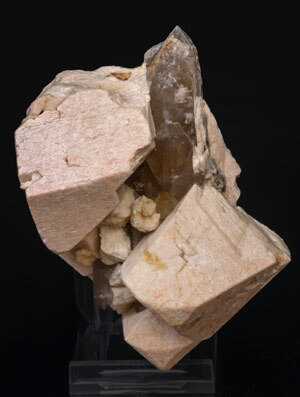 Very sharp isolated Microcline crystals, one of them clearly dominant, with simple forms that have a particular shape that is well known as “coffin-like.” On matrix with white Albite crystals and smoky Quartz. 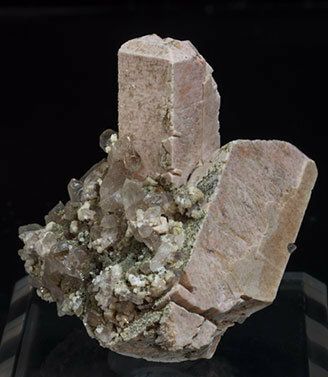 Very sharp Isolated Microcline crystal with simple forms, with a particular shape that is well known as “coffin-like.” It is on matrix with white Albite crystals and smoky Quartz. 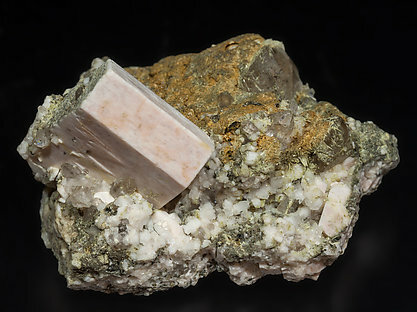 Two elongated Microcline crystals, one of them with the Baveno twin law and the other with double twinning by the Baveno and Manebach laws. They are on matrix with Quartz crystals and Epidote-Clinozoisite coatings. Prismatic crystal of very well defined faces and edges and a very well marked Baveno twin. Lower on the sample there is an small matrix of Albite and a small flat crystal of smoky Quartz. 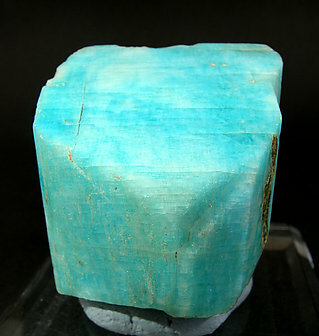 A crystal of Microcline with simple forms, with a very well marked Baveno twin all along the prism. 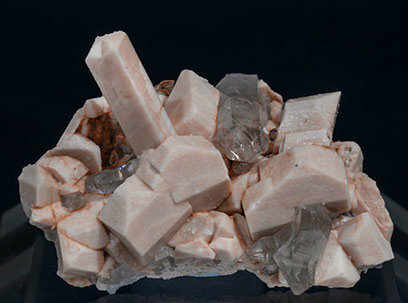 It has pinkish color with fine perthitic growths and it is on matrix with crystals of smoky Quartz and white Albite crystals. 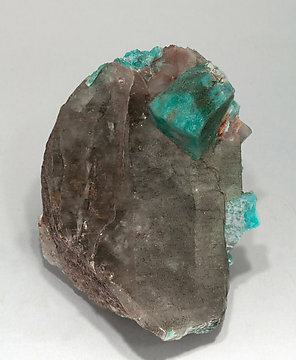 The little crystal of Fluorite is the item on the piece. 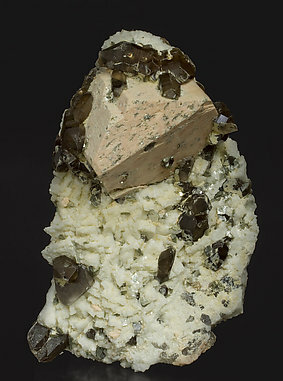 A typical sample from Pikes Peak, with Smoky Quartz and Microcline (amazonite) embellished by this little cube of colorless Fluorite with little purple spots.